Once Upon A Tree01531 670263work BreweryOnce Upon A Tree was launched in May 2008 through a passion to create the best quality cider from the highest quality fruit, whilst continuing to preserve the heritage and tradition of cider-making in the area. The apples are sourced, and the juice and cider made at Dragon Orchard situated in the heart of the traditional apple growing area of Putley near the Marcle Ridge in Herefordshire. With a combination of good orchard management, fantastic soils and perfect mesoclimate, the fruit produced is some of the best available anywhere in the UK, with the apples attaining full ripeness yet retaining character and flavour. Juice and Cider maker, Simon Day is an experienced professional winemaker who decided to turn his hand to cider making after walking through the local orchards and seeing the potential to use winemaking skills to capture the true characters of the apples in the juice and ciders. From an initial small start the company has expanded production year-on-year, exporting nearly half of the production to the USA and more recently Japan, coupled with an ever increasing appetite for their craft ciders in the UK. Once Upon A Tree have won many awards over their history, with particular highlights including BBC Radio 4 Food & Farming “Drinks Producer of the Year” 2013 and winning the Bath & West Champion Perry Trophy in 2015. 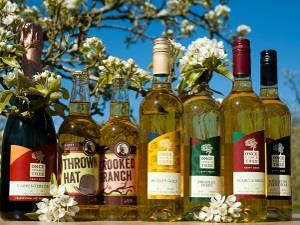 Once Upon A Tree was launched in May 2008 through a passion to create the best quality cider from the highest quality fruit, whilst continuing to preserve the heritage and tradition of cider-making in the area. Three Counties Cider Shop – On the High Street of Ledbury opposite the clock tower.